IAF's efforts to promote and support general aviation in Idaho fall into several categories. Examples of those categories are listed below, but are not limited to this list. IAF is soliciting grant requests/proposals and raising money to support these kinds of efforts. IAF strives to make more airstrips accessible to the public, and to create amenities to help people enjoy current airstrips more. The project to rebuild historic Big Creek Lodge for public use was started in 2013, and is nearing completion. See www.rebuildbigcreek.com for more updates and ways to get involved. Idaho has many wonderful recreational airstrips that provide camping, showers, shelter, etc. IAF helps to improve upon those existing facilities by maintaining or enhancing them. IAF provides annual grants to the Idaho Aviation Association to cover amenities such as picnic tables at a variety of state-maintained airstrips. IAF provided a grant to assist in long-needed improvements at Chamberlain and Cold Meadows. IAF recognizes that Idaho has unique flying challenges and opportunities. To help pilots be safe and good stewards in the backcountry, the IAF supports ways to educate and promote the public use airstrips in Idaho. IAF installed a webcam at Sulphur Creek (ID74), providing a view to the east from the lodge; and two more at Mackay Bar (ID28), one looking north and one looking west. The service is available year-round and enables pilots to check visual conditions before taking flight(these webcams and more are available on our Airstrips page). IAF provided a grant to offset research expenses for a new edition of Galen Hanselman's Fly Idaho! pilot reference book. This book was initially released in 1991. Many things have changed since that time: timber has grown, and fires have changed the landscape, making some approaches more challenging. Some airstrips have been improved, and others have declined. 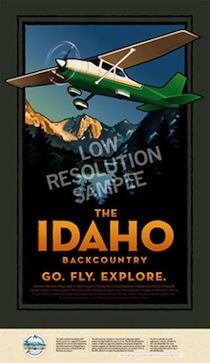 IAF supports this work as Fly Idaho! is an important resource for Idaho and out-of-state pilots. Over the years, IAF has provided grants supporting Wilderness Within Reach, an annual program in partnership with Boise Parks & Recreation that introduces disabled and handicapped individuals to a weekend in the backcountry via small aircraft. IAF has funded a new Idaho Aeronautical Chart, which includes updated position reporting locations and names of Fire Towers (also helpful for position reporting). This was an important safety tool. To buy the updated chart, call the Idaho Division of Aeronautics at 208-334-8775. IAF funded an exhibit booth for Idaho Aviation Association to promote Idaho Aviation and safety throughout the west.